Alden Projects™ announces Double Standard: Ed Ruscha & Mason Williams 1956 – 1971 (Part 1) to inaugurate a new ground floor gallery space at 34 Orchard Street, New York (between Canal & Hester Streets). 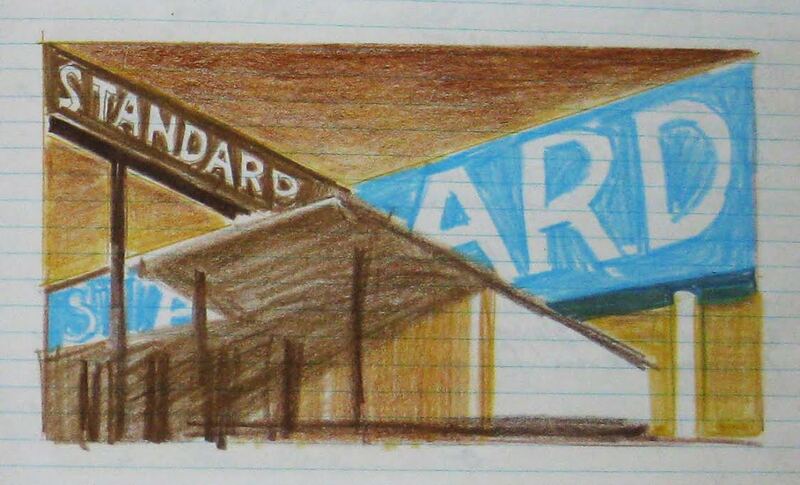 This historical exhibition explores the early dialogues, collaborations, and elective affinities between Ed Ruscha (b. 1937) and Mason Williams (b. 1938), Ruscha’s life-long friend since fourth grade in Oklahoma City, where he lived a few blocks away. Williams occupied a unique, occasionally co-conspiratorial vantage in Ruscha’s early development. The two friends drove together in 1956 from Oklahoma to Los Angeles: Ruscha was bound for art school at Chouinard, and Williams—prior to pursuing a career as a folk singer—was headed towards a career as an actuary. Williams’ highly detailed log book of oil and gasoline expenses from this early road trip suggests a fitting fraternity for Ruscha’s later driving, and matter-of-fact destinations. In Los Angeles, the duo lived at various times as roommates. This show looks at the far-flung projects and Dada-inspired capers that the duo produced and co-published together—and in tandem—in convention-defying publications beginning as early as 1964 (Ruscha was commissioned to make the photograph for the cover of Williams’ first book, Bicyclists Dismount). The title of this exhibition is drawn from Ruscha’s most sought after print, Double Standard (1969), which may surprise viewers to realize was actually a full-fledged collaboration between the two artists. Of notable focus here is Ruscha and Williams’ weekend-long, desert road trip with Patrick Blackwell to the Sahara Hotel in Las Vegas on August 19 - 21, 1966, when the trio generated not one, but two seminal books together: first, Mason Williams’ lost classic, The Night I Lost My Baby (1967) a photo and text narrative with gold covers about a lost girlfriend in Las Vegas (with layout and endpapers by Ed Ruscha and photographs by Patrick Blackwell); the arrangement of the photos was determined by a throw of dice. The second book initiated from this same road trip was Royal Road Test (1967), a dead-pan and matter-of-fact documentation of the results of throwing a Royal typewriter out the window of a speeding car on a desert highway. (Tellingly, Ruscha was “the driver,” and Williams “the thrower”). The book was co-published by Ruscha and Williams. This exhibition also focuses on a small, but extraordinary body of art by Mason Williams. The latter’s 36 foot long Bus (1967)—a life-size, silkscreened image of a Greyhound bus and folded like a map—was conceived around the same time as Ruscha’s silver-covered Sunset Strip (which also unfolds to over 27 feet). Also present is Sunflower (1967), Mason Williams’ series of never previously exhibited vintage photographs which document the artist’s attempt to make the world’s largest drawing—in smoke. "In 1967,” Williams recalls, "I had an idea for a film: to draw the world's biggest sunflower. The film was to be a slow-motion aerial ballet in which an old bi-wing aeroplane skywrite “draws” the stem and leaves of a flower in the sky beneath the sun, the sun itself thereby becoming the blossom of a ‘Sun’ flower." Although the film was unrealized for technical reasons, the photographs here at Alden Projects™ are all that remain of this wonder-making caper. To make the work, Williams hired the aviator who reputedly invented the art of skywriting to execute his drawing. Williams does not understate his friend's impact, partially dedicating his 1969 book, The Mason Williams Reading Matter as follows: “To Ed Ruscha for opening my eyes.” (Paradoxically, this book alone was printed in an edition of 165,000—more than the entire output of all editions of all of Ed Ruscha’s self-published books combined.) For his part, Ruscha's use of a Mason Williams story—a parable about creativity and sexuality—in his book Crackers (1969) provides another example of how the dialogue between the two artists plainly went both ways. Ruscha also adapted Williams’ story into his 1971 film, Premium. In some ways, this exhibition represents the road not taken for Williams. Although his Bus was exhibited at the Pasadena Museum of Art in 1967 and at the Museum of Modern Art in 1969, the artist significantly abandoned visual art after achieving fame as a Grammy Award-winning composer (“Classical Gas” was a Top Ten Billboard Hit in 1968) and as a screenwriter for the censored Smothers Brothers Comedy Hour. While Ruscha’s originality stands in a class by itself, this is the story of two brilliant childhood friends who made perplexing publications together and separately, and who shared a curiosity to explore the surprising, ephemeral places that art can occupy in everyday life.